Listing courtesy of Thomas Fecske (CalBRE #01963185), Alta Realty Group CA, Inc.
Gorgeous Estate Home nestled along the Santa Susana Mountains & Chatsworth Nature Reserve. 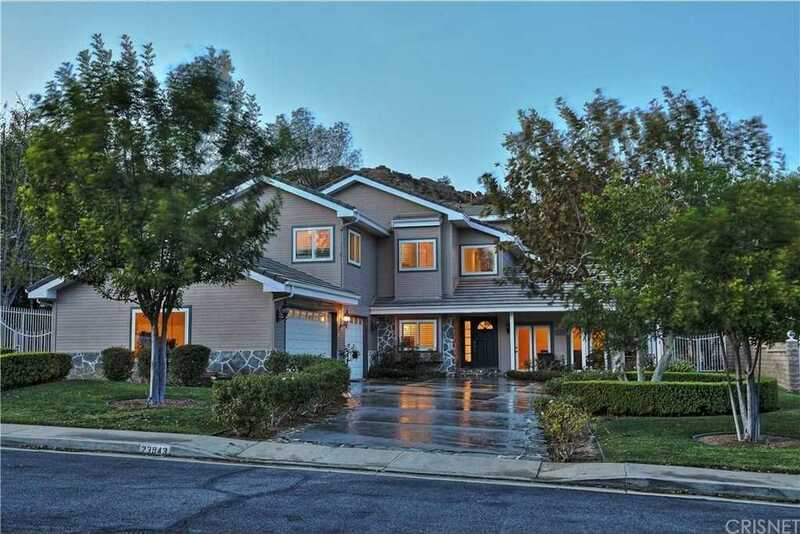 This 4+4 w/ loft home is located in this very private and gated community and it has it all!! Travertine Flooring, Oversized Baseboards, and Paint, along with a Custom Kitchen that overlooks the huge backyard. The backyard boasts a beautiful pool with patio, custom batting cage, and a basketball court. Downstairs includes a bedroom with attached 3/4 bath. Step down to the beautiful living room with high ceilings and fireplace. The kitchen includes a Sub Zero built-in refrigerator, center island with sink and built-in breakfast nook. The kitchen is open to the family room which includes a fireplace and built-in cabinets. The laundry room leads to the additional 3/4 bath with direct access to the backyard. The upstairs Master Suite has an additional fireplace, sitting area and a totally remodeled bath, which includes a free standing tub and oversized shower. Upstairs includes 2 additional large bedrooms with newly remodeled Jack and Jill bathroom, along with a loft. This beautiful home had new windows, new air conditioning, ducting, furnace/air handlers installed in 2015. Don’t miss out on this One of a Kind Estate!! Building size: 3806 sq ft.
Based on information from CARETS as of April 22, 2019 22:26. The information being provided by CARETS is for the visitor's personal, noncommercial use and may not be used for any purpose other than to identify prospective properties visitor may be interested in purchasing. The data contained herein is copyrighted by CARETS, CLAW, CRISNet MLS, i-Tech MLS and/or VCRDS and is protected by all applicable copyright laws. Any dissemination of this information is in violation of copyright laws and is strictly prohibited. Any property information referenced on this web site comes from the Internet Data Exchange (IDX) program of CARETS. This web site may reference real estate listing(s) held by a brokerage firm other than the broker and/or agent who owns this web site. The accuracy of all information, regardless of source, is deemed reliable but not guaranteed and should be personally verified through personal inspection by and/or with the appropriate professionals.